Our understanding of the love of God has been tragically distorted. The comfortable, sentimentalized version we commonly encounter today is far from the biblical depiction of God's love. Featuring contributions from well-known evangelical scholars, this multi-disciplinary study presents the biblical view of the love of God from the perspectives of systematic theology, biblical theology, apologetics, pastoral theology, and ethics. The contributors-including D. A. Carson, Andreas J. Köstenberger, Raymond C. Ortlund Jr., Robert L. Plummer, and many others-address a variety of issues related to how God's love is expressed in the Old and New Testaments, the Trinity, apologetics, Christian living, social justice, and more. This addition to the Theology in Community series will promote clear, sound thinking about what Scripture means when it declares that "God is love." 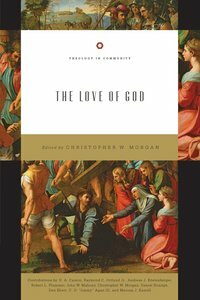 About "The Love of God (Theology In Community Series)"
Christopher W. Morgan (Ph.D., Mid-America Baptist Theological Seminary) is associate dean and associate professor of theology at California Baptist University in Riverside, California. He is senior pastor at First Baptist Church in Barstow, California. He is author of Jonathan Edwards and Hell and general editor (with Robert Peterson) of Hell Under Fire, Suffering and the Goodness of God and Faith Comes by Hearing: A Response to Inclusivism, and he is currently writing a commentary on the book of James. Robert A. Peterson (Ph.D., Drew University) is professor of systematic theology at Covenant Theological Seminary in St. Louis, Missouri. He was formerly professor of New Testament and theology at Biblical Theological Seminary in Hatfield, Pennsylvania. His books include Getting to Know John's Gospel: A Fresh Look at Its Main Ideas, Why I Am Not An Arminian, Hell on Trial: The Case for Eternal Punishment, Calvin's Doctrine of the Atonement, Adopted by God: From Wayward Sinners to Cherished Children and Hell Under Fire (coedited with Chris Morgan, Zondervan). He has written numerous articles, was a contributor to the second edition of the Evangelical Dictionary of Theology (Baker) and edits Covenant Seminary's journal, Presbyterion. Pre-Order now to secure your copy. Expected to ship September 2019.